Looking to have a fully custom branded registration process? 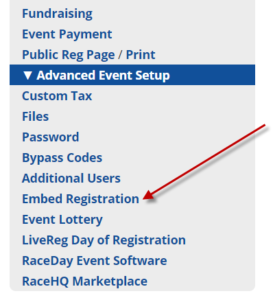 Embedding registration allows event directors to have all the convenience of the athleteReg platforms, while keeping their participants on their own website for the entire experience. Embedding registration involves placing a snippet of code from your athleteReg event onto your own website. This piece of code allows your registration page to display and function entirely within the confines of your event website. With some magic on our end, all clicks from the athleteReg calendar will automatically send participants to your website with the embedded registration, which allows event directors to take full advantage of our calendars and search function. Using this tool is simple and quick. Head into your event on your athleteReg platform and expand the Advanced Event Setup menu in the main Event Setup menu on the right. Next, select the Embed Registration menu option. This will take you to a page where you can check off a box to enable the registration widget. Enter in the URL where the registration will be hosted on your own website and then grab the snippet of code from the box below. On your own website place the entire snippet of code on the appropriate page, inside the body of the html on that page. Once the code is in place, head back to the Embed Registration page which will let you know if the code has been properly implemented on the URL that you specified.